Widget Ads may link with any other rich media format, and may include features such as Custom Video, Dynamic Data Feeds, Interactive Elements, Polls and more. Widget Ads may be distributed in a multitude of ways, from a branded Web site, PR campaign, word-of-mouth outreach, or even through another rich media ad. 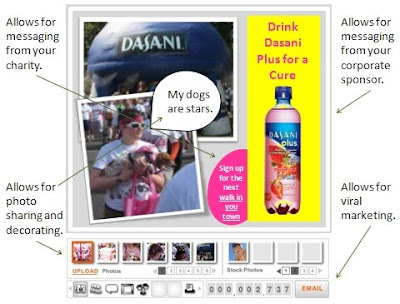 The ibubble widget allows a charity to promote its cause, such as in the case of a walk-a-thon, while giving the user a value-added and fun application for them to decorate and share photos. Furthermore, perhaps a charity has a corporate sponsor of its walk-a-thon, ibubble also becomes a marketing vechile to deliever the corporate sponsor's message. These and other widgets alone will help your charity provide greater value to potential corporate sponsors in the future. These widgets are great for membership based organizations. It allows nonprofits to stay connected with its members throughout the year by pushing additional messaging, which will help to create a greater affinity to your cause beyond what a signal event can do. If your charity has members, then as part of their membership, provide them with such an application. You can present a variety of “calls to action” from month-to-month, such as renewing their membership, disaster relief purposes, invitations to private events, etc. The more value-added features the application provides to the members the more likely they will utilize it.